The Friday night lights were shining over Skyway Park in Tampa last month as the Cambridge Christian School Lancers ended their season undefeated with a 45 to 6 win over Carrollwood Day School. The team's victory celebration ended as it always does when the players and coaches gathered for a post-game prayer. To the team and the school community, prayer is more important than who wins or loses. That's why before every kickoff, a prayer is said over a public address system. "The only way to unite families together is over a loudspeaker scenario," said the school's headmaster Tim Euler. "It gives our families an opportunity to come together as moms and sons and dads and sons for a moment before the game for a prayer of thanksgiving." 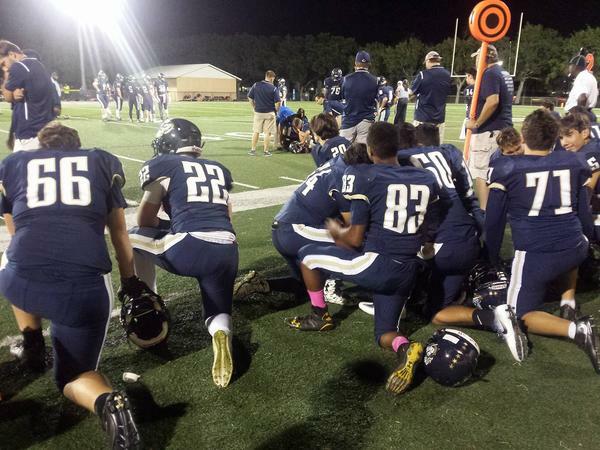 If Cambridge Christian School has a successful run throughout the regional playoffs, they will earn a return to Camping World Stadium, and like they did when they made it last year, the school will ask the Florida High School Athletic Association to allow them to use the venue's public address system for prayer. A year ago that request was denied. In September, the school filed a lawsuit against the organization that manages high school sports in Florida, alleging violation of their civil rights to religious freedom and free speech. "The state needs to be neutral towards the expression of religion in public, not telling everybody including all the student athletes that are watching that somehow engaging in religious speech in public is wrong," said Jeremy Dys, a lawyer with the First Liberty Institute. The legal organization focuses on religious cases and is one of the law firms representing the private Christian school. “The Constitution fully protects schools like Cambridge and the students at the school to be able to engage their faith in the school, out of the school, and certainly in the public sector at large as well," said Dys. "That's why this case is so important." But the FHSAA has asked a federal judge to dismiss the lawsuit, saying it is obligated to uphold another part of the First Amendment in not allowing what would amount to a state-sponsored prayer in a facility predominantly paid for with public tax dollars. The organization declined to comment for this story, but Catherine Cameron, a professor at Stetson University says both sides have merit. "You know obviously the First Amendment, the way it’s structured, it’s pretty clear that the government can't have a law that would restrict somebody from expressing their free speech," said Cameron. But, she says, there is a flip side to that. "If they have a law that essentially allows someone in their free expression of religion to somehow force that expression on to someone else, then there's an argument that the government is actually aiding in forcing another person to be part of their religious expression and religious experience," she said. While no hearing has been scheduled, high school football continues. Back at Cambridge Christian School, no matter when the season ends, prayer will continue. The only question is whether or not it's over a loudspeaker. Cambridge Christian School defeated Admiral Farragut of St. Petersburg 38-14 Friday night for a Class 2A Region semifinal win. They will play Northside Christian in St. Petersburg November 18th in the next round of the playoffs.